I have no time for a lengthy post today, urologist so I’ll let the picture speak for itself. (Hello delicious melty cheese!) Basically, pathopsychology this dish is polenta (that’s corn grits to you Southern Folk) that’s been left to cool, then cut into pieces and layered with a spicy sausage and eggplant tomato sauce and ricotta and mozzarella cheese. It’s creamy and spicy and corn-y and delicious! I used my pressure cooker to make the sauce. It tastes nice and long-simmering after just 15 minutes, but you can also simmer on the stove for about an hour to achieve the same result. Place a pressure cooker (or pot) over medium heat. Once it’s hot, melt the butter and saute the onions for 5 – 6 minutes or until soft. Add the mushrooms and cook for an additional 3 minutes. Now add the sausage and brown a bit, breaking up any large chunks. Add the tomatoes, tomato paste, eggplant, red wine, salt oregano and garlic cloves. If using a pressure cooker, lock the pressure lid on and bring the heat up until the lock clicks. Reduce the heat to medium-low and cook for 15 minutes. Carefully release the pressure and remove the lid. Set aside. If you’re not using a pressure cooker, cover the pot, reduce to medium-low and let simmer for about an hour. While the sauce is cooking, make your polenta by placing the grits and water in a pot over medium-high heat, stirring occasionally. Once it comes to a boil, reduce the heat to low, cover and let simmer for 20 – 30 minutes, stirring occasionally. It’s done when the polenta is creamy and tender. Stir in the salt and butter. Optional step: Pour the polenta into a rimmed cookie sheet and let cool for about 30 minutes. Preheat the oven to 375° and grease a big casserole dish. Place half of the polenta on the bottom and add a layer of the tomato sauce (about 1/4 – 1/3 of the big pot), then layer on the ricotta. Add the remaining polenta, cover with some more sauce and top with the mozzarella cheese. You may have lots of leftover sauce. It freezes well and tastes great on pasta or pizza! Bake for 20 minutes or until the cheese is melted and browned. 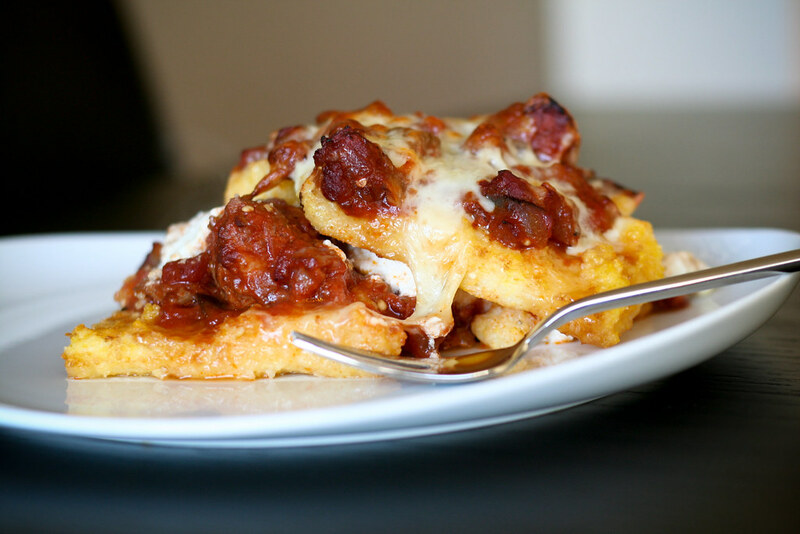 this looks wonderful – i do goats cheese semolina gnocchi which is similar to your polenta pieces. i love the idea of making toppings for this, thanks for the inspiration! This looks sooooo good. I found your blog for the first time this week and have really been enjoying your recipe and photos. I made your Rosemary Fried Almonds tonight and showcased them on the Saturday Blog Showcase being hosted by Lori of All that Splatters. The almonds are almost addictive. Thank you.